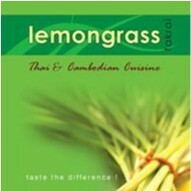 Lemongrass Takrai joined our Mission to help provide access to “Clean Water for All by 2030”. This Mission was initiated by the United Nations. A big thank you to Lemongrass Takrai’s team and customers for joining this extremely important mission on 01 December 2017. "I have had takeaway from Lemongrass countless times and it's always good; the staff are very friendly and the place is always spotless. There's a surprisingly large and quiet courtyard out the back if you want to dine in. Favourite dishes include mussaman curry, ginger or cashew stirfry and the rice paper rolls."